No commissions. Local located on one side of the commercial center Tarterssus in Urbanization Novo Sancti Petri of Chiclana. The place has two heights, in its ground floor a free height of 2.5 m and in the upper floor a free height of 5.5 m. Built up: Pb. 69.59 m2.Planta high 58.58 m2 and mezzanine 20.34 m2. Total area: 148.51 m2. Suitable for professional dispatch. Great townhouse bank repossession in Cájar. The house with 155m2 consists of 3 bedrooms, 2 bathrooms, 1 toilet, large living room with fireplace, fully fitted kitchen, attic, terraces and garage. Don´t miss this opportunity! Magnificent bank apartment in Cájar, in urbanization with pool. Its 67m2 are distributed in kitchen, 2 bedrooms, bathrooms, living room. It also includes a garage. Bank opportunity in Almuñecar! Townhouse just 500m. from the beach, in urbanization with swimming pool and surrounded by all the amenities. The house with 109 m2 is distributed in 3 bedrooms with fitted wardrobes, 2 bathrooms, living room with fireplace, kitchen. cellar, garden, patio, porch, 2 terraces and solarium. Call for more information! Apartment in one of the most touristic areas of Benalmádena Costa, just one street from the beach, in front of Merendero el Malagueño. Nice apartment of 50 meters . all exterior , with balcony, large living room with terrace and open views to the swimming pool and gardens, american fitted kitchen open to the living room, bathroom and bedroom. The house is located just 50 meters from the beach and the promenade of Benalmádena coast very close to the castle of Bilbil. The house in perfect condition is located in an urbanization with large swimming pools and low community expenses. In the area we find urban transport, taxi stop, restaurants, shops, health center. Easy access to the town of Fuengirola by the coastal road. If you need more information, do not hesitate to contact us! Charming townhouse in Las Yucas, in a gated complex with communal pool and tennis court. Unbeatable location, close to restaurants, schools, supermarkets, international schools, golf courses and bus stop. Only 800 meters from the beach! The house with 130 m2 is distributed in 3 bedrooms, fully furnished kitchen, 2 bathrooms and 1 toilet, large front and rear patio and garden areas. Don´t hesitate and call for more information, ready to move in! 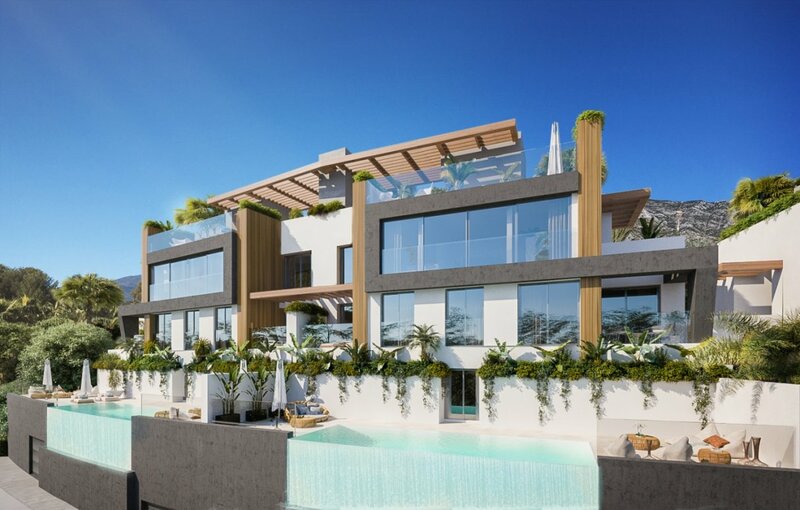 Duplex penthouse in Santangelo, Benalmádena. Sensational duplex penthouse located in the Santangelo area, in perfect condition. It is located in a gated community with communal pool and children's area, very well connected, right next to the exit to the highway, which connects with Malaga and its international airport and less than 5 minutes by car to the beach of Torrequebrada. The Commonwealth has an urban public bus that transports neighbours to the supermarket area and the beach area. In the area we find commercial areas, restaurants, hotels and social clubs. The property with 120m2 is distributed in two levels: On the first level we find a room with built-in wardrobes, plus a bathroom, and equipped kitchen that connects to a large living room, from the living room you can access to a south facing terrace with 15 meters from which we can enjoy magnificent panoramic views across the Bay of Benalmádena. On the second floor we have 2 bedrooms with fitted wardrobes, a bathroom and a second terrace with open views over the sea. The house has all the guidelines so we can enjoy the sun almost all day. Private parking space included in the price. Don´t hesitate and call to visit this incredible property! In the prestigious Urb Augusta Golf of Novo Sancti Petri, winner of national architecture awards is this 4 bedroom and 3 bathroom townhouse completely renovated, on one floor. Private garden, communal pool and garden areas in front of the golf course. Less than 1 kilometre from the beach and shopping centres. The urbanization consists of surveillance 24 hrs and private parking area inside the same. Don´t miss this opportunity! Don´t miss this opportunity to live in a luxury townhouse in Alhaurin de la Torre, ready to move into! This house is distributed: - Ground floor : hall with toilet, large kitchen equipped with all appliances, living room with beautiful panoramic views of the mountain and access to terrace of 40 meters with barbecue. From this floor we go down room-cellar or leisure area with bar and space to use as a room, children's area with electricity includes storage room. Entrance housing with parking space and lawn. - 1st floor: we find the master bedroom with en suite bathroom and amazing views, fitted wardrobes, two more bedrooms, with fitted wardrobes and a full bathroom. In this house, it is important to highlight the energy-saving systems installed, solar panels. - 2nd floor: solarium plus third bedroom, with access to a large terrace and views over the city of Malaga and mountains. The house is located in a very quiet area with easy access to the motorway to Malaga, in urbanization with swimming pool and paddle tennis court. Community fee € 28 / month. Quick sale and very competent price, request your visit without obligation! Exclusive apartment in perfect condition. It is the 2nd floor, facing south/east, large terrace of almost 20 meters and unbeatable views of the Mediterranean Sea and the Bay of Fuengirola. The complex has large communal gardens where there are 2 magnificent swimming pools. Sold with FURNITURE, a private parking space is included. It consists of 92 useful 2 bedrooms, one of them en suite, plus additional bathroom. As extras: Central AACC, Domotics, Alarm, Siemens kitchen, Climalit blinds to Folding, hydromassage bath, Located in urbanization with 24h security, it is a few steps from the Sport Club and the Double Tree by Hilton Hotel. One step away from shopping center, surrounded by all services, international schools and medical centers. 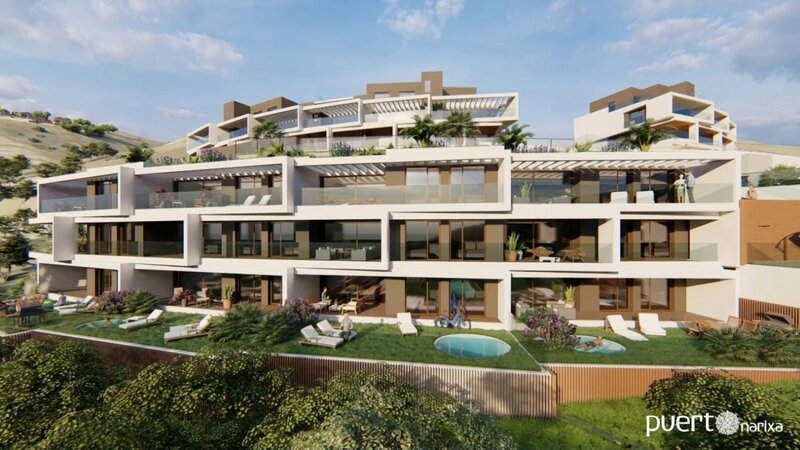 The complex of luxury apartments and penthouses is located in the highest part of the Reserva del Higuerón Urbanization, there is a tourist train available with a descent to the coast less than 1km away as well as urban transport and taxi rank very close. Benalmádena village is only 700 meters away and the municipality of Fuengirola is 10 minutes away, as is the International Airport of Malaga on the highway and less than 30 minutes by train. Don´t miss the opportunity and call to make your appointment! Apartments in einer natürlichen und exklusiven Umgebung der Costa del Sol, mit den renommiertesten internationalen Schulen in der Umgebung, Sportclubs, Einkaufszentren, Restaurants und medizinischen Zentren in nur zehn Minuten Entfernung und das alles nur 45 Minuten vom Flughafen entfernt. Malaga Die Anlage besteht aus Reihenhäusern und Wohnungen, die bereit sind, von den anspruchsvollsten Familien eingezogen zu werden. Die Wohnungen mit 194 m2 verteilen sich auf Küche, 2 Schlafzimmer, 2 Bäder, großes Wohnzimmer und eine große Terrasse von 75 m2. Außerdem haben alle Garage und Abstellraum im Preis inbegriffen. Genießen Sie eine wunderbare Lebensqualität, Rufen Sie an, um Ihren Besuch zu machen, bereit zum Einzug! Privileged location next to the hotel and the shopping area, very close to the recreational facilities of the resort: lake and artificial beach, lake club, golf course and academy, tennis, spa ... A few minutes by car from Puerto Banus and Marbella. Great opportunity for investment, vacation space or permanent residence. plot of 4,944 m2, buildable 494 m2 with fantastic sea views. Modern luxury villa with spectacular panoramic views of the sea from any corner of the house in Puerto de la Duquesa. 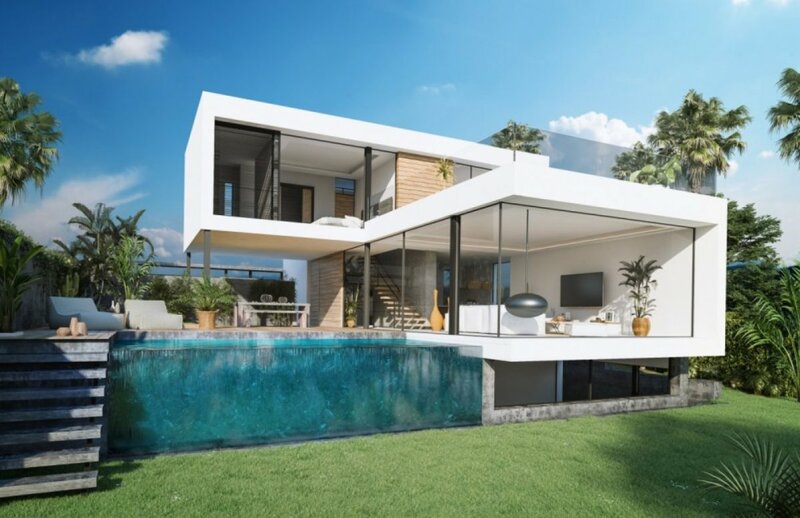 Designed and established on 2 levels, with floor to ceiling windows that allow light to enter the interior and is protected from the sun by its architecture and design. With a location to the southeast and parallel to the beach, this beautiful villa, like all our villas, will have the energy certificate A. The villa has 4 bathrooms and 4 bedrooms, all with views of the Mediterranean and access to its terrace. This villa has been designed using the latest techniques to have an ecological and low maintenance building. Enjoy this new contemporary Mediterranean lifestyle!